When we announced we were going to travel around the world for 12 months with our two sons aged 5 and 9, most people first asked us if we won the lotto and then the next question was “What about school?” To be honest this was the least of my concerns given the list of things to do to leave Australia for 12 months was very long. Most people made comments about what a fabulous experience this would be for the kids, which of course it is. I only received one negative comment “I could never take my child out of Year 5”. I was a little surprised since this person has travelled the world themselves … but I didn’t let it deter me from what we were planning to do and I haven’t yet lost any sleep about taking my child out of Year 5! The school year in Australia ends in December so both boys finished the 2010 school year. The new school year for 2011 started in January; Harris was to enter Year (Grade) 5 and Patrick was to start the Preparatory Year, a non-compulsory year of schooling before Year (Grade) 1. As Patrick didn’t have to attend the prep year, it was really only Harris we had to worry about and be granted permission to take him out of school. I approached Harris’s state primary school (public elementary) to ask about what was required in order to leave the country and fulfil our obligations. I was given a simple form to complete, which I promptly filled out. I also included a two page additional document which detailed how we would meet state outlined Key Learning Areas whilst travelling; this information I found online on the state education website. Obviously I did a good job convincing the Deputy Principal that we were capable of schooling our children enroute because we were given a letter which stated Harris was granted ‘exemption’ for the whole school year. This meant that we did not have to officially enrol in Distance Education or Home Schooling; both are expensive options and require frequent reporting and documentation; something I knew nothing about and wasn’t keen to learn! So with letter in hand we could safely leave the country. We bought the boys the two maths and English workbooks that were listed for their school year; a handwriting book for Patrick and also a number of other age appropriate workbooks to take along the way. I had downloaded a number of educational games onto the iPods e.g. telling the time and sight words, plus I’d bought a number of books for the Amazon Kindle for Harris and Patrick to read whilst travelling. I also purchased a number of basic workbooks for Patrick when in Vietnam as they were really cheap. It is important if you are travelling for an extended period that you have a good supply of English/your language workbooks as it can be quite difficult in some places to find what you need if you run out of activities. I know we will have a lot of choice for workbooks in UK and USA to replace any that have been completed. I have taken photos of the completed workbooks as we travel so that we can leave them behind in whatever country so we don’t have to carry so much paper or have the expense of mailing the books home. Our only goals for the boys was for them to complete their school workbooks during the year, read books and take in the world around them. The boys started their ‘home schooling’ early before we even left Australia. We had seven weeks of Christmas vacation prior to leaving Australia in which to commence workbooks and have the added benefit of visiting teachers aka grandparents. Both my parents and Steve’s had the opportunity to participate in the boys’ schooling when they were minding the kids for us. This time was valuable in attempting to set up some sort of routine and expectations about what would happen with schooling when travelling. So how are we travelling with the school stuff after five and half months of travel? Well let’s just say that whilst I wasn’t concerned about it at the start I am even less concerned about it now. One year of their little lives without sitting at a desk is really not such a huge deal. Schoolwork has been done in spits and spurts and certainly not every day. Patrick and Harris have contributed to the website along the way with drawings and some web posts. It might seem easy to school every day but in really it isn’t and we don’t always want to think about fitting it in either. As full-time travellers there are often more important things to do like think about where we are going to sleep the night; where our next meal will come from and spending the day sightseeing. Our boys have schooled in other ways such as catching public transport and planes all over the world; watching foreign TV; reading menus and eating different foods and drinks; walking around grocery stores; reading street signs and maps; talking with people all over the world; visiting zoos, museums and science centres and just being in different countries and absorbing what is going on around them. Some places we have stayed have been more suited to official schoolwork such as whilst we were volunteering in Cambodia; sitting in coffee shops in Hanoi, Vietnam and in our apartments in Hong Kong and London. 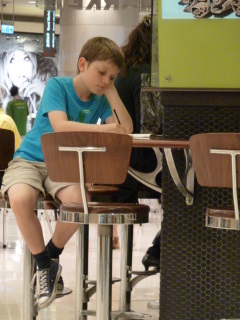 We have attempted homework in the car, on planes, in restaurants, in numerous coffee shops, food courts and hotel rooms. Sometimes it works, sometimes it doesn’t. Schooling your own children comes with many challenges; usually they don’t appreciate you telling them anything so teaching them division is not always easy. Schooling your own children really highlights your children’s learning styles, ability and areas of educational need. Those parents that make the decision to officially ‘home school’ their children are amazing! We never intended to home school our kids past this year and I am even keener for them to attend school next year to interact with their peers and enjoy the school environment; both our kids are very social and miss playtime and extracurricular activities. If anything, our travels so far have really highlighted how important education is and choosing the right schooling environment for our kids when we return to Australia. There is the possibility that Harris may have to enrol in the Year 5 when we return to Australia. We have already explained this to Harris and informed him that he may need to complete some testing. Whilst we have completed workbook activities, they are more to keep his brain active than to replace a whole year of school. Harris in the Taipei 101 Foodcourt in Taiwan doing homework! 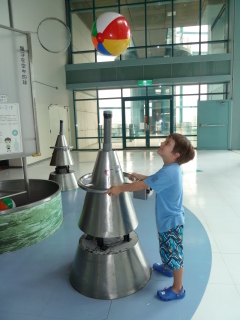 For Harris, aged 9 and nearly 10; so far our travels have given him the opportunity to try many different activities; wrap his tongue around countless languages and see firsthand the value of education in people’s lives. We hope that with this knowledge he will have an everlasting passion for education, travel and languages and may in some way influence his decision on a future career path. He may just become a travelling bum! As long as he is happy, earns his own income and moves out of home before 25 we aren’t concerned! Patrick has had the opportunity to be a kid for another year. The prep year of schooling as a wonderful year but for him it would have been very similar to the pre-prep year he had just experienced. We have endeavoured to cover the educational concepts he would learn whilst at school this year so we have no qualms about him starting Year 1 in January 2012. He may not have many concrete memories of this year but I hope by keeping the website up to date and making photo albums for each of the , this will assist Patrick in remembering his year overseas in some small way. Patrick in the Taipei Science Centre in Taiwan. We have many months of travel ahead of us still and know that there are opportunities ahead that will be better suited to official schooling e.g. when in an apartment in Spain for one month. We are contemplating doing some campervan travel around the USA and Canada in October so I’m sure the boys will relish the chance to do maths whilst we drive! When we return to Australia in January for have a couple of weeks for the school year starts on which to cram in some intensive division and sight words! If your state or country requires extensive schooling records and documentation for your children when out of the country for a substantial period of time, then this will certainly impact your decision regarding travel and length of travel; but don’t let it hinder you entirely from taking your children out of school and travelling anywhere. Excellent write-up! I’m always trying to read up on how other parents are tackling the exercise of homeschooling or ‘unschooling’ their children on the road. We’ve got 2 we’re yanking from the school system, one going into Grade 8 (12) and the other Grade 9 (14). IMHO, traveling the world will be a FAR better teacher and long-term investment for our kids. There are however a few things the school does offer that might be difficult when traveling – what normally comes to mind are two things: the social aspect of life & public speaking. Being that we’ve got a couple of teenagers (soon) we’re pulling away from friends, most people we talk with about our plans instantly call into question the impact our trip will have on their social lives. Personally, I actually don’t lose any sleep over it. Our kids are fairly well-adjusted, they’re certainly not introverts. And depending on how long we decide to take root in a particular spot, I can see this aspect of their lives being enhanced. As well, I do envision enrolling our kids in a local English school in some parts of the world for extended periods if my wife can get a job there (she’s a schoolteacher) – this would probably mean meeting and hanging with other expats (or nomads). The other issue is public speaking. That’s one facet of normal schooling that I believe holds merit and is a super-valuable trait in later life. But how do we accomplish this on the road? I’ve thought of a few ideas such as approaching the Principal (Headmaster) in schools around the world and ask if our kids can come in and give talks in English (or French) to classes. That might be easier than it sounds, but I think it would work. Other than that though, I’ve come up short on ideas. One other thing – you need the option of allowing me to choose whether I get an email when there any new comments/replies in a blog post. Otherwise – I just have to keep coming back checking to see if I got a response. It’s great to hear of different things that you are both doing with the boys. We’re inclined to think the same as you guys as far as schooling is concerned. While it was a thought in our minds as to how both you and the boys would cope with the schooling aspect; the different angle to education would be far superior to the basic schools curriculum. There is no greater teacher than first hand experience. That’s from a Grandpa who was only able to learn in a satisfactory way by practical skills learning. Personal experience counts for a huge amount. They say that for every picture there is a thousand words. I say that by first hand experience there there are ten thousand words and other learning experiences that words cannot explain. It is a great thing you are doing for the boys. There’s not a day that we don’t think of you all. Keep safe and learn for yourselves as well even some special experiences that maybe you may not be able to explain too. Great to hear from you. Hi there, Yes, that was something my web design guy was to add sometime ago. Sorry I am not technically minded enough to do it myself! Sounds like you have an adventure ahead too. Your kids are definitely at an age to encourage public speaking if they don’t embarrass easily. I found our children coped better with speaking to younger children or teenagers rather than their peer group. If you make it to Australia in your travels then look us up! Not to sound corny, but isn’t life the greatest lesson of all? No need to worry about your boys – they are bright young men who are absorbing everything while you are ‘on the road’. I bet they are the best at bartering when they get back to school too! No amount of schooling could teach the boys what they have been experiencing this year. I would think that their perception of the world, maturity and compassion will far excede their peers. As a teacher I have taught a number of children who have had similar experiences and they are different in the classroom in a very refreshing way. Keep safe and enjoy the ride! Thanks for all the wonderful comments. Keep them coming! Congratulations on being picked as one of the top travel blogs:)- I found you through the notice on babble. We travel a lot with my 4 kiddos, so I can’t wait to read more! Awesome post- I am forwarding this to my husband in the hopes that I can convince him to do the same:). If you are ever in the southern US you are welcome to come visit:). Thanks for reading Becky. Good luck with your travel ambitions! Won’t be in the south this trip but maybe next time we are in the USA. Likewise if you get to Australia then look us up.